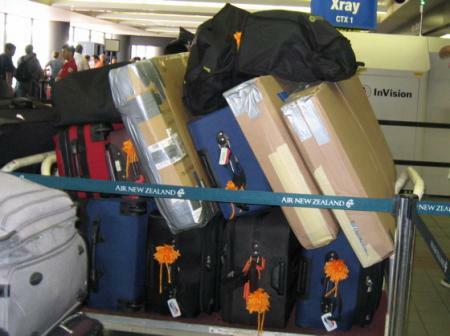 New Zealand Air’s website states that each passenger is allowed two pieces of checked luggage, one carry-on, and one personal item. That put the Halversons’ allowed load at ten checked bags, five carry-ons, and five personal items. Twenty bags total. Sounds like a lot, doesn’t it? When my husband and I pre-packed our bags two nights before our flight from Los Angeles to London, we realized that we’d vastly overestimated how much stuff could fit in twenty bags. We needed twenty-three bags, easy. So we started trimming. And biting our tongues, big time. You see, my husband and I have different philosophies when it comes to packing. His focus was on bringing enough toiletries to stock us for the year and thus save us buying necessaries at twice the price (the U.S. dollar is currently half the pound, so deoderant priced at 2 pounds would be like $4 to us). Plus, he likes his brand of deoderant; he doesn’t want to experiment and switch. I, however, find it difficult to look at a suitcase full of deoderant, loofas, dental floss, and shaving cream while three new pairs of green Wellies with froggie eyeballs and all our boys’ stuffed animals sit next to it, pining for a home in the already filled luggage. I’d rather pay $4 for deoderant ten times over than leave Blue Monkey at home. My girlfriends in the triplet playgroup found this dilemma hilarious. In their minds, the solution was easy: dump the dental floss. (Well, the chemist triplet mommy didn’t advise this; she was totally in sync with my scientist husband on this point, interestingly. Must have something to do with the scientific mind.) But to me the dilemma was more complicated than dental floss. There’s a lot of give and take in a marriage, and the spouses involved know exactly where the line lies. I knew that my husband and I would go head to head about those toiletries if I pushed too hard. The key was to find a middle ground. That, or toss and turn wildly that night in extreme stress and anxiety right up to the edge of a full-fledged freak out until my husband finally realized that if he was to sleep at all, he had to come up with something to appease me. Turns out that approach works splendidly. The next night, when we sat down to do the final packing, my husband pared down his toiletry stockpile just like he’d promised in those wee hours. He also pulled out some spare shoes and I pulled at least half of the clothes out of my suitcase. We pared down to the bare minimum and then counted our bags. Shoot! Still one bag too many, thanks to ridiculous airline rules that count three booster seats as three pieces of luggage. In most cases, carseats are free on airlines! Not so for us and our boosters. We couldn’t leave those behind, though, nor could we leave my husband’s bike (in a bike box) and the three crib mattresses we were bringing for the boys. Yes, three crib mattresses. Oh, the drama surrounding that packing decision. Some folks said we were kooks for even thinking of schlepping three crib mattresses across the ocean. You can buy some in England, they said. For DOUBLE the cost of the mattresses we have, we replied. You could take air mattresses, which pack smaller, they said. And which get rips and must be patched or repaired and will need to be pumped up every few days and are just too big to fit three in the tiny room we’re traveling to, we replied. It’ll be a nightmare having those big things at the airports while trying to juggle seventeen other pieces of luggage and three-year-old triplet boys, they warned. But one day of extreme migraine is better than 365 small headaches, we countered. Still, they thought us kooks. I could understand that opinion, actually, as I’d gone back and forth on the mattress issue myself. I did this for months, actually, nearly making my husband crazy in the process. While he was measuring dental floss and calculating his year usage, I was polling everyone I knew about crib mattresses vs air mattresses vs buying something to sleep on in England. I finally settled on the crib mattresses four days before we left. That’s when my high school friends Jennie and Julie, both experienced travelers and mothers who knew a lot about camping supplies, independently advised the crib mattresses. One line from Jennie summed it all up: “You’re going away for a year,” she said, “you’re gonna have a lot of crap. You might as well have the crap you need.” Done. Crib mattresses it would be. Our last challenge was the weight limit for checked luggage. Checked bags exceeding 50 pounds would be charged, although we didn’t know how much that charge would be. I’d heard $50 from some sources. *Gulp* Bags exceeding 70 pounds would be dumped into the ocean by the airline. They didn’t want ’em, period. Staring at our one-too-many pile of luggage, we decided that if we were going to go over the 50-lb limit, we might as well go way over, right up to the 70-lb cut-off. So we condensed and rearranged again, trying to get down to our twenty-bag limit. At 2:30 a.m. we gave up. We’d have to hope we could pay to take an extra bag. If the airline flatly refused, we’d leave one boy’s mattress behind. Our fraternal boy ends up sleeping on the floor most nights, anyway, now that we’ve sold the cribs and have the mattresses on the floor. He wouldn’t care. Much. Being just hours before we’d be leaving for the airport, I made my way to bed and my husband stumbled into the garage to pack up his bike. That’s when he encountered one last packing crisis: he couldn’t get the pedals off his new bike and thus couldn’t close the bike box. Of course, no bike shop would be open in time to fix the problem; he’d have to leave the bike and box behind. This was the nearest I got to really losing it during this packing process. He’d spent several hundred dollars on the bike and the bike box. I was NOT glad that we’d now have to buy a bike in Lowestoft so he could ride the two miles to his new school each day. But unless I could rip those pedals off with my small girlie hands, I had to take comfort in the fact that without the bike we’d no longer have one piece of checked luggage too many. So how did the mattresses work out? Was it complete hell dealing with them and seventeen other pieces of luggage and three-year-old triplets? Interestingly, the mattresses turned out to be no big deal at the airport. In L.A., we pulled up to the curb, snagged a porter with a huge luggage cart, and let him deal with everything. We merely stood in line and checked in at the counter. We were so grateful to him that he ended up with a $35 tip, between the cash we kept handing him and what my parents gave him. And then, oh glory, New Zealand Air didn’t charge us a thing for our ultra-heavy luggage, not one cent. They did, however, re-count our bags and discover that somehow, in our tired delirium the night before, we’d still managed to pack one bag too many. “That’ll be $100 dollars,” the check-in clerk said. My jaw dropped and I glanced over at the porter. Think he’d give back that thirty-five bucks? I wondered. Just as my husband started to point to a mattress and say, “Take that off the scale,” he had a brainstorm. He unslung his, his “personal item”, from his shoulder and jammed it in a booster seat bag. It fit! He’d carry on the booster seat with the laptop inside as his personal item. We’d be able to take all three mattresses! If I didn’t know better, I’d swear I heard my almost-sleeping-on-the-floor-for-a-year son sigh in relief. I know I did. $100? Yikes. The mattresses were no big deal in Heathrow airport, either. Again, luggage carts came to the rescue. It was a bit more challenging because the boys were super cranky at that point in the trip and we didn’t hire a porter. But we lived through it. So far, then, the mattresses have proven a good call. At this very moment, the boys are upstairs sleeping on their mattresses, comfy and content on the familiar mattresses in a world that has little else familiar to it. And my husband is just as comfy in the living room, kicked back on the purple sofa, smelling lovely thanks to his favorite deoderant and quite content that his teeth are freshly flossed with his favorite brand of dental floss. And blue monkey? Did I squeeze him into a suitcase? You bet I did! Blue Monkey is here on British soil, tucked firmly in my son’s sleeping arms. There’s no way I’d leave Blue Monkey behind, not for all the deoderant or dental floss in America. Debbie . . . I would have sent you deodorant and floss!!!! I have to say that there are some things you can’t travel without. Not sure about dental floss, but I have my favourite nappies for the kids (went to NZ without them – NOT fun!). Glad you got all you needed hauled over, including Tonka trucks! Hope you are settling in ok, and now have a fridge (wtf?!) and the dryer has arrived. Catch up once you have caught your breath! Yeah – what’s up with no fridge? I new that dryers were few and far between over there . . . . . . are you sure your washer isn’t one of those washer/dryer combo freakish machines? And how much does your washer hold anyway? 3 tee-shirts? I’m guessing you are going to re-define what constitutes “dirty” clothes!